I’ve already mentioned my deep and abiding affection for Aesop. I always have something Aesop in my skincare routine but just realised that I haven’t actually done any product reviews. The products look great but how do they actually perform? Well I’m a picky customer and I wouldn’t rave about any brand that was just style with no substance. First up is an oil that is one of my winter staples. Aesop’s products are botanical based but it doesn’t bill itself as a “natural” brand though many of its products do tick the boxes. The company does not use any mineral oils, silicones, parabens, colourants, animal products or synthetic fragrance (with the exception of one perfume). Firstly can we talk about the scent. It’s divine. There’s rose but not English garden rose, we’re talking a sensual, spicy, Arabian Nights, heady fragrance thanks to the mix with neroli. Packaging is in an apothecary style bottle made from amber glass, which as well as looking good, helps to protect the oil and extracts from UV rays which degrade it. On the flip side, it comes with a teat pipette, which I love using as it makes me feel all science-y, however that means potential contamination and exposure to air when the bottle is open. 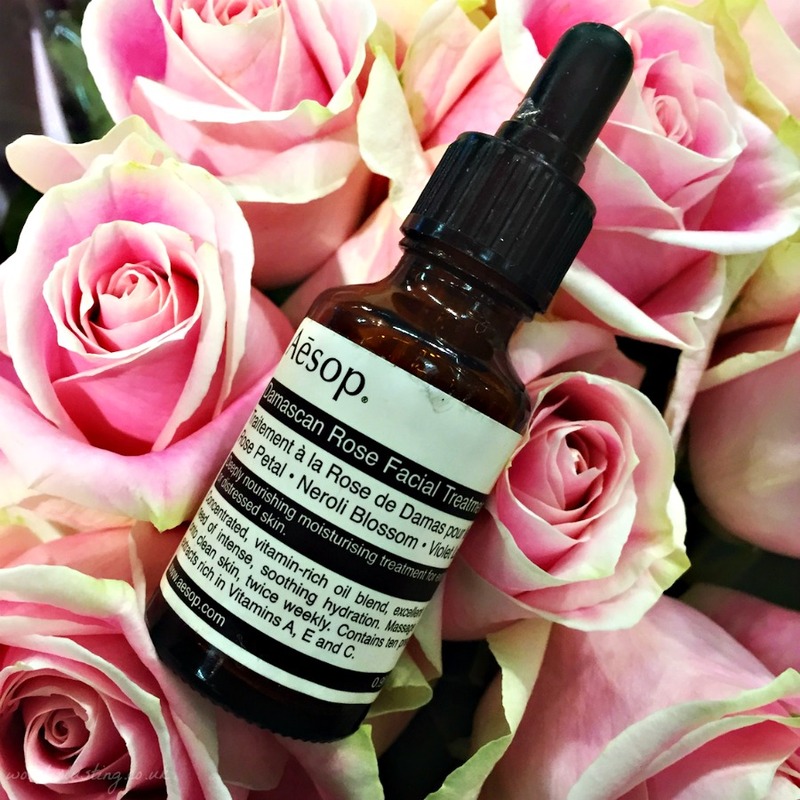 Aesop Damascan Rose Facial Treatment is a blend of plant oils and botanical extracts bursting with nutrients and skin nourishing properties. Despite the name, Damascan rose oil is fairly low down on the ingredient list but this is not necessarily a bad thing. Precious rose essential oil is extremely potent and very expensive and labour intensive to produce. Most rose products are made with Rose Absolute, a refined extract, which smells as sweet but is far cheaper. Aside from the intoxicating smell, rose has an array of benefits that make it great for the skin. Rose oil is antibacterial, healing, anti-inflammatory, nourishing and hydrating and is used in aromatherapy to soothe the mind. It takes 50 roses to make one drop of pure Damascan rose oil, 25ml would take around 50,000 roses and you might have to sell a kidney to buy! 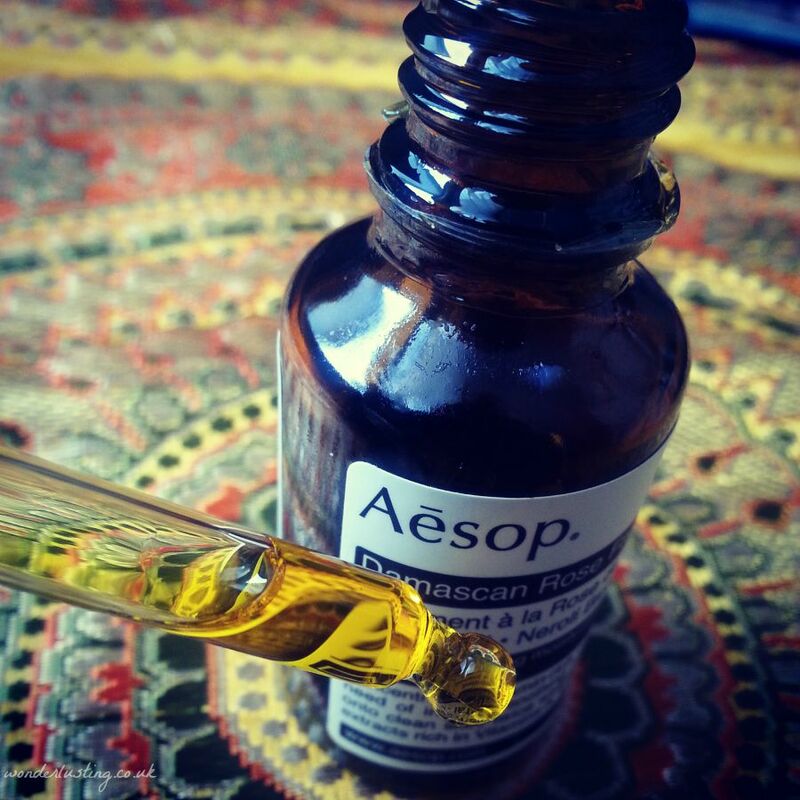 Which partly explains the price tag of this Aesop oil. The main ingredients are camellia japonica seed oil and evening primrose oil, both powerhouses for all skin types. Camellia japonica oil has long been prized in Japan as a key part of a geisha’s beauty ritual. The oil is packed full of fatty acids and antioxidants and is also non-comedogenic so doesn’t block pores. Evening primrose oil is one of the richest sources of the essential fatty acid GLA (gamma-linolenic acid) that helps improve skin elasticity and reduce inflammation. It has been scientifically shown to help improve certain skin conditions. The blend also contains rosehip oil, which has super high levels of natural retinol (Vitamin A) and essential fatty acids, which research shows helps to improve skin elasticity, protect against sun damage, and help skin repair. A little of the Aesop Damascan Rose Treatment goes a long way. Despite being rich and quite a thick texture, it sinks in to the skin quickly without any greasy after feel. The instructions state to use five drops twice a week though I use less. In the spring/summer when my skin goes from dry to more normal I use three drops a few times a week as a serum at night. My skin feels velvety in the morning. During autumn/winter when my skin is dry and sensitive, I use three drops in the morning every other day, especially after exfoliating. I also sometimes add a drop to my foundation or tinted moisturiser to help keep my skin hydrated and glowing despite weather ravages. My skin soaks it all up and feels nourished. This is one of my favourite oils to use, especially in the winter when my dry, sensitive skin is in need of extra pampering. Though described as for “extremely dry or distressed skin”, I think all skin types except for very oily could benefit from Aesop Damascan Rose Treatment. You might have to play to see how many drops and how often suits your own skin’s particular needs. Pricey but worth it. Aesop Damascan Rose Facial Treatment Ingredients: Camellia Japonica Seed Oil, Oenothera Biennis (Evening Primrose) Oil, Prunus Amygdalus Dulcis (Sweet Almond) Oil, Rosa Canina Fruit Oil, Oryza Sativa (Rice) Bran Oil, Glycine Soja (Soybean) Oil, Tocopherol, Daucus Carota Sativa (Carrot) Seed Oil, Rosa Damascena Flower Oil, Citrus Aurantium Dulcis (Orange) Flower Oil, Viola Odorata Oil, Daucus Carota Sativa (Carrot) Root Extract, Beta-Carotene, Citronellol, Geraniol, Linalool, d-Limonene, Farnesol, Eugenol. It’s just gorgeous especially for winter skin. Previous Previous post: #100LippyDays October in Lipstick and Mission Completed!